Well, I finally finished a small project that I have been wanting to do for a long while. Back around 1980 Dad bought a couple of beach cruisers and brought them home. I am not exactly sure why, but there they were and they were so cool to have around. When I went to college in 1984, I took one to school with me to ride around campus. It got ripped when I left it “locked” up in the choir room for the weekend while I was out on tour with 40 others. MANY years went by and the other one that was left with my parents began to deteriorate while being stored on the side of the many houses they lived in ever since. The wheels got all rotted out and rust began to do its work on the chrome. There it sat…for years… just waiting to be cleaned up. Forward to the end of 2009. After Dad had passed, I went to Mom’s house to help clean out the garage and get rid of a bunch of “crap”. At the end of the day, a full construction sized dumpster was full to the brim. 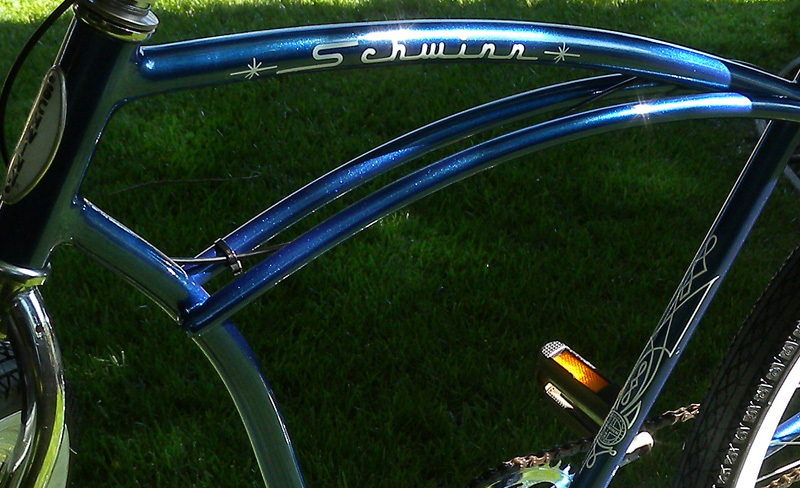 However, the old Schwinn ended up in the back of my truck. I brought it home to sit on the side of MY house for another 9 months. Not that I needed another “project” but I did need to resurrect this bike, as it represented to me some physical connection to Dad. It was one of the only significant items that I have that he ever gave us. His love was broad and deep. He was generous to everyone that knew him. 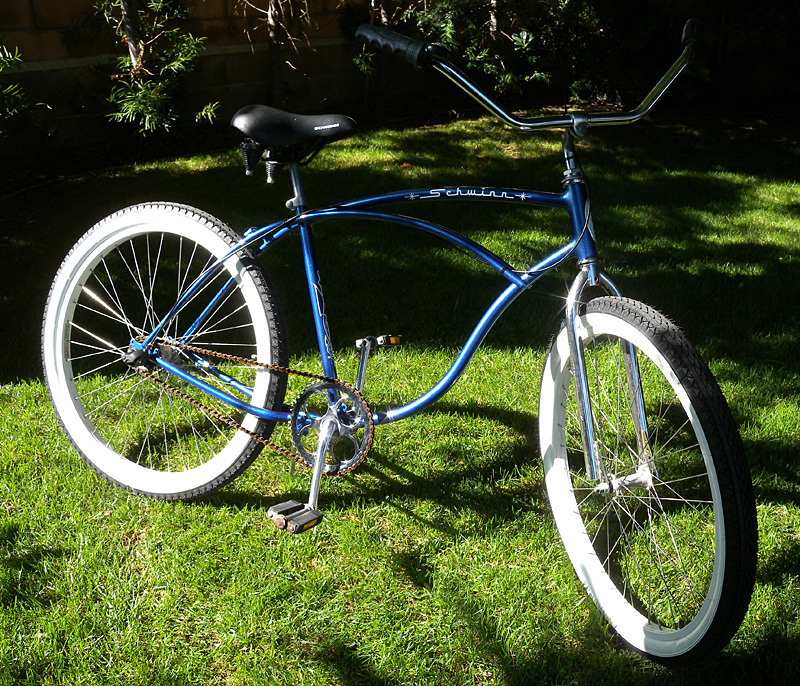 I have some coins, as many people do… a few small items that I have gotten from him over the years, even a small very used old pocket knife that was left in his jeans on the morning of his passing… but this bike – I felt compelled to restore it and to enjoy it with my family in his memory. So, here’s to you Pop. I changed out the old wheels and tires for these awesome white walls. 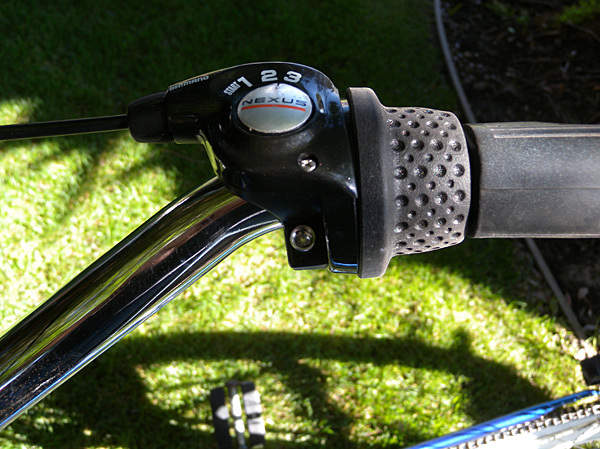 The rear wheel is fitted with a Shimano 3-speed gear box. I replaced the missing seat with a new cruiser seat I got from Mr. Candish. 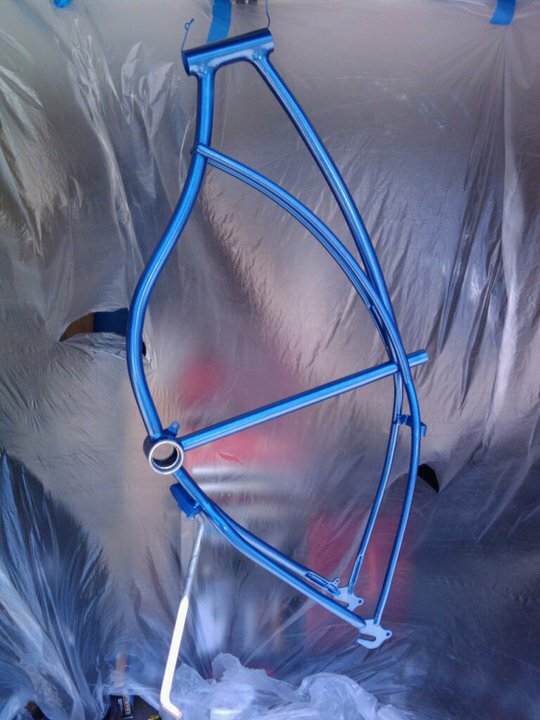 The paint is 3 coats from a single can of Rust-o-leum Metalflake Blue. Water decals supplied by Ebay seller bicyclebones, and over the top of everything, Cal Customs in Camarillo shot a dense coat of clear to seal the deal. Everything is original, including the rust-orange chain, but I think that will have to go soon. Very nice to have that memory of your Dad. A wonderful connection. Thanks for sharing that Richard! This is so very wonderful!!!! Not only is a fabulous tribute to your Dad but what a fun and well-done project!! 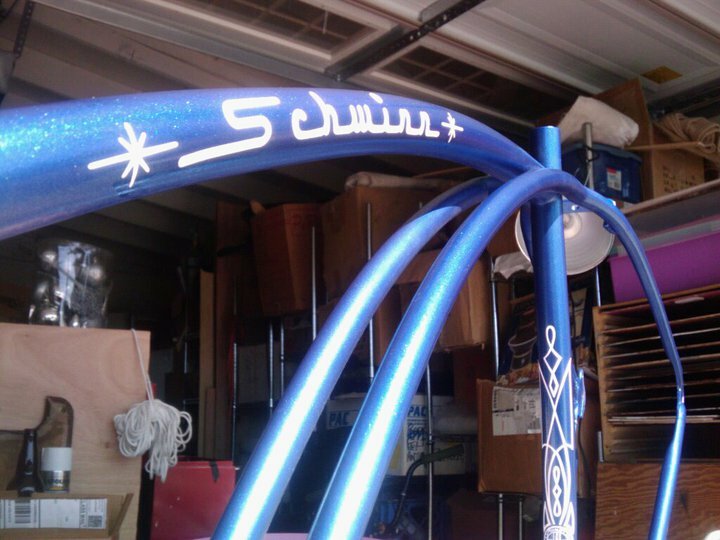 It turned out beautifully and I’m sure you and your family will have tons of fun riding it! !